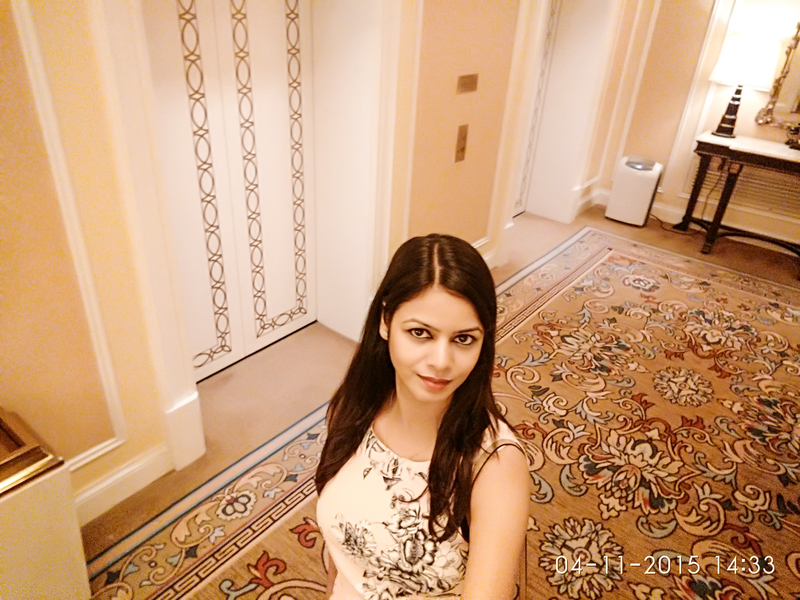 Welcome to the City of Dreams…!! Macau is an incredible destination for those who wish to experience world class gambling, entertainment, culture and history. It follows the fusion of Portuguese and Chinese culture. It is also known as Las Vegas of the east. It has many famous casinos such as Sands, Lisboa, The Venetian and Wynn. 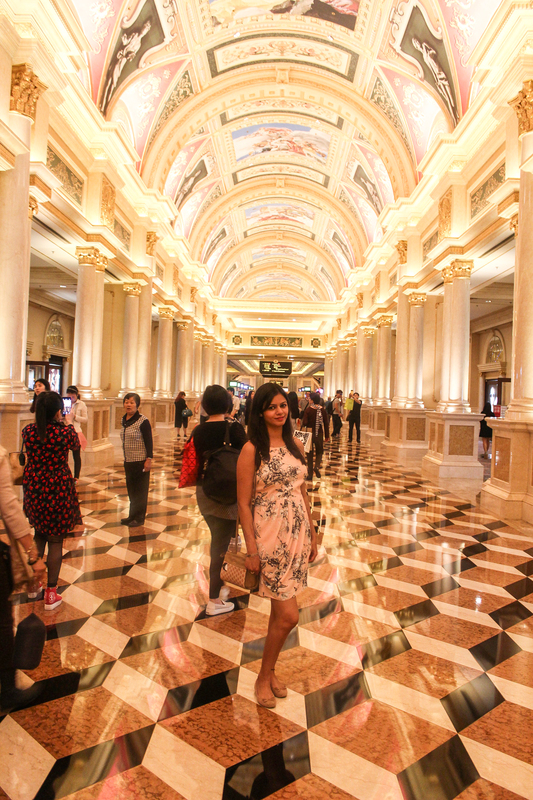 Macau provides visa on arrival to Indian tourists. The only documents you need is your passport, a photo(passport size) and the immigration form which is given to you on board flight/ferry. On 3rd of November 2015, we boarded a nonstop Cathay Pacific flight from New Delhi to Hong Kong , which took around 5 hours and 15 minutes to reach. After reaching Hong Kong International Airport, we did not go through immigration but we directly got transferred to Hong Kong ferry within the secured arrival area and boarded the ferry for Macau ferry terminal. We collected our luggage after immigration in Macau. You can buy ferry tickets in advance from the website https//www.turbojet.com.hk/en or you can buy the tickets on the spot at ferry terminal. If you are doubtful that your flight might be delayed and you may miss the ferry, you can buy the tickets at the ferry terminal only. If you are buying in advance, be sure to keep sufficient time between arrival flight and departure ferry. The one we booked was Cotai water jet that took around 1 hour to reach Macau. It was a premium high speed ferry with endless view of sea that made our journey very safe and comfortable. Plenty of food options are also available in their food court. After completing immigration process, we collected our luggage and came out of the airport. By this time we were so tired that we just wanted to reach the hotel as soon as possible and relax. So we boarded our complimentary shuttle to hotel. The Shuttle was parked just outside the airport. Macau offers many choices of world class hotels and resorts. 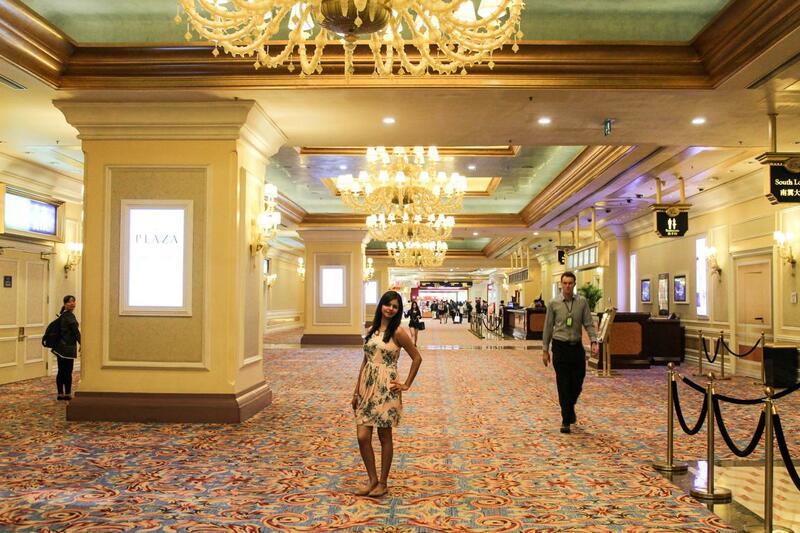 We stayed at “The Venetian”, which was perfect in every aspect. It has its own shops, restaurants and casino. 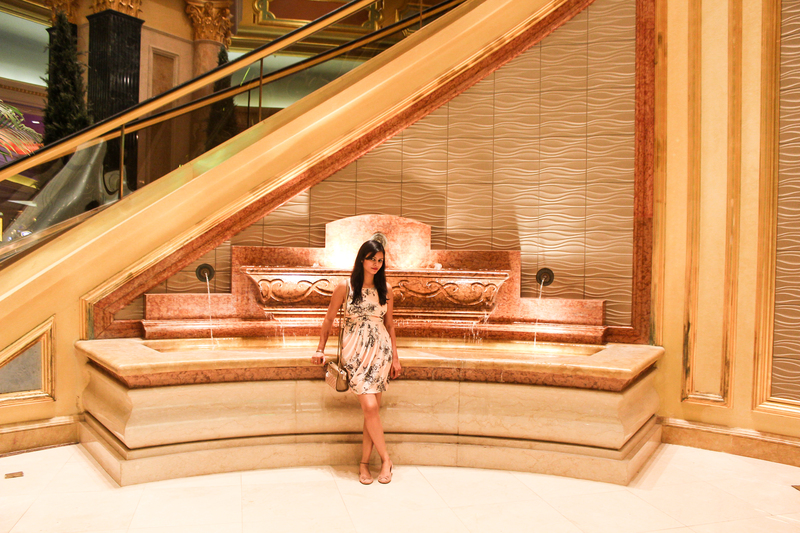 I think no amount of words and pictures can describe the beauty of venetian. The hotel is gorgeous and huge. 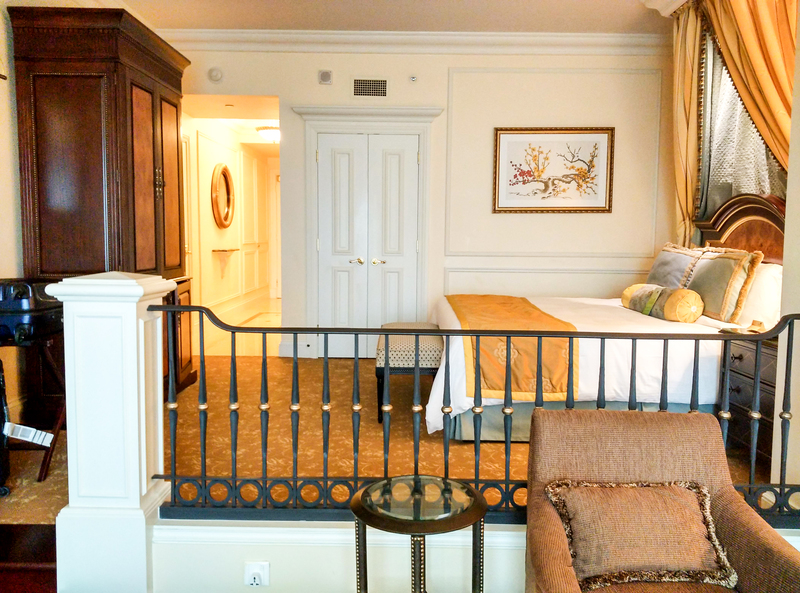 It is perfect for honeymooners as well as families. The roof of hotel lobby was decorated very well with beautiful chandeliers. Lightening effect used in entire hotel was a cherry on the cake. Entrance of the hotel is through Main Lobby and hotel suits are located in West and South Lobby. You may get lost in this huge area, so make sure to carry maps that are available in the Main Lobby. 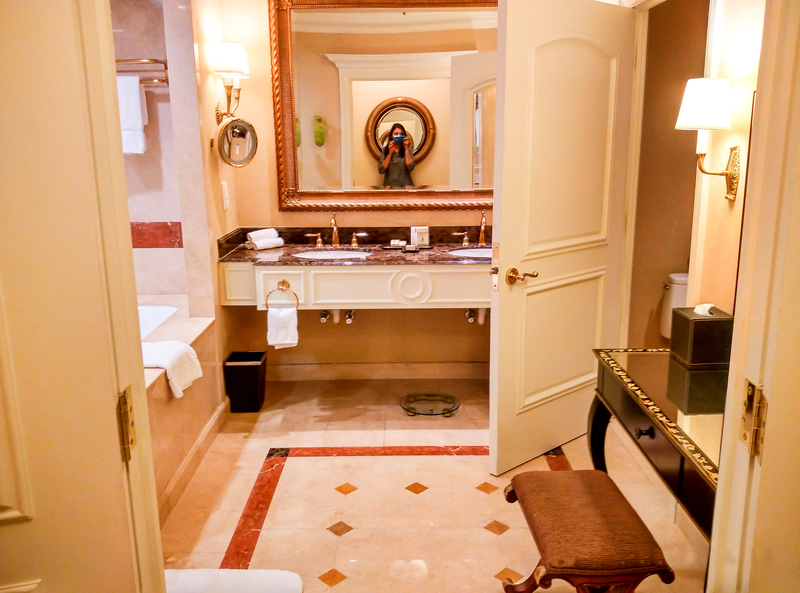 We booked a Royal Deluxe suite for two days. 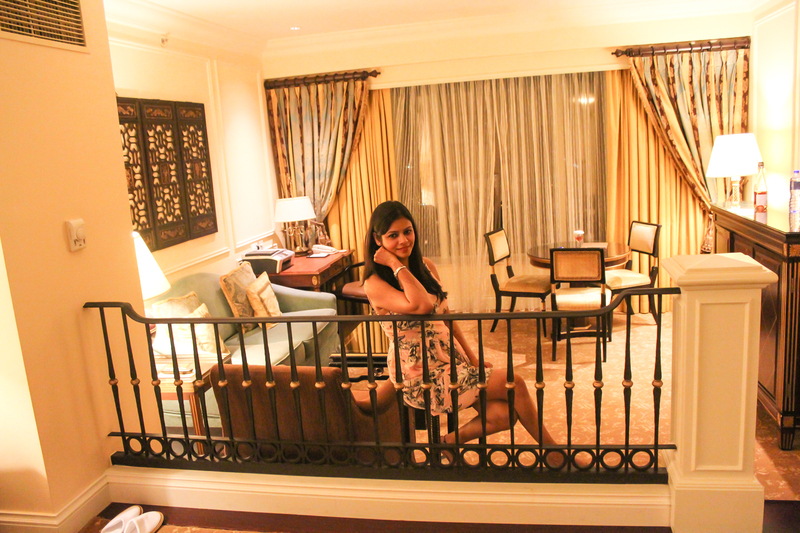 The room was beautiful, huge, hygienic and well maintained with a beautiful view of city and Macau airport. Hotel staff was very professional and cooperative. We found everything perfect and mesmerising. Our hotel room included one complementary meal per day. Hotel reception staff provided us with complementary meal vouchers which could be used for either breakfast, lunch or dinner in the hotel restaurants. They also gave us few complementary vouchers for shopping and other independent restaurants in the hotel. It was already evening by the time we checked into the hotel, and also we were very tired so didn’t make any special plans for the evening. 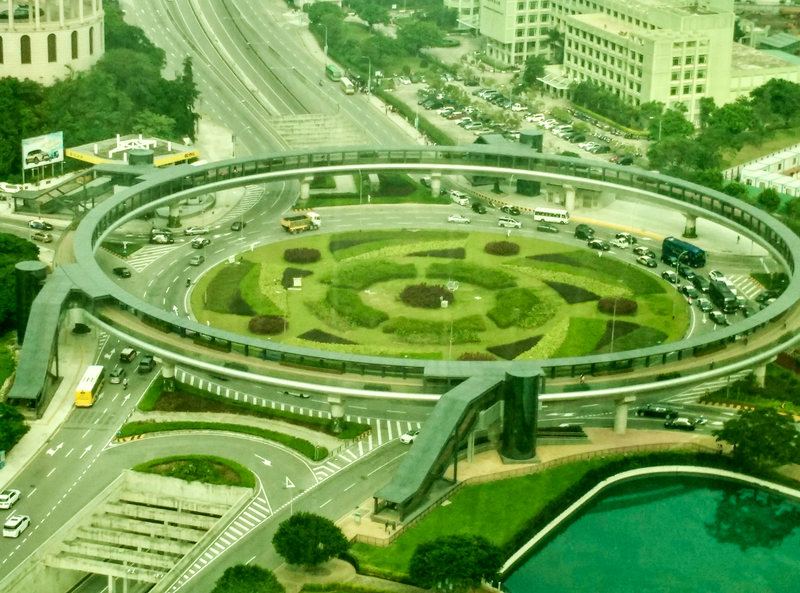 We just booked a 9 am city tour for next day from Cotai Travels. It included hotel pickup and drop-off. There office is available at the hotel lobby and it was our pickup location as well. It was a 4 hour tour. They charged a fare of 500 MOP/HKD per person. At night we went out for dinner. We took a taxi to nearby Indian Restaurant ” Indian Garden”. It was a small restaurant with many vegetarian options available. At 9 AM we assembled at the meeting point of our tour. We boarded the tour bus and got off in the old town. Our tour guide was comfortable in speaking English as well as Chinese. Our tour included 8 viewpoints. 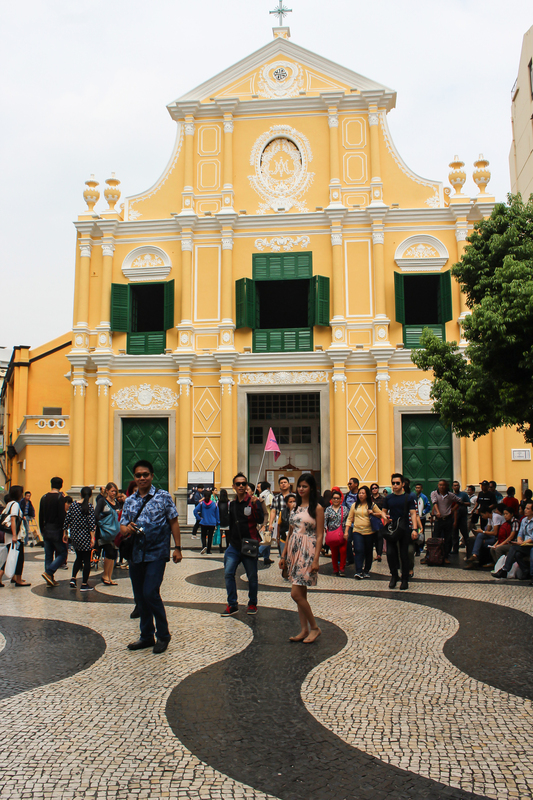 Let’s start exploring Macau. We reached the museum around 9:15 am but it was closed at that time. There were different houses like house of time, photo gallery, history, etc. Our tour guide explained the beauty of each house. She also told us that it is a very good place to buy souvenirs. We got out of the tour bus and started to walk along with our tour guide. 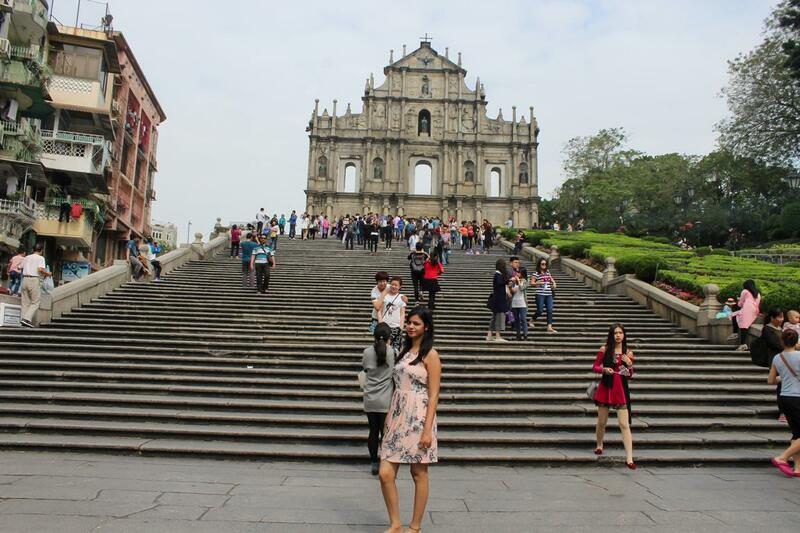 Ruins of St Paul, probably the most famous landmark in Macau, is also a part of the city’s Historic Centre. We climbed some stairs to have a closer look of it. It’s architecture was impressive and well maintained. But you will find this place very crowded. Looking at the brighter side, it was easy to find someone who could take our photos. After clicking some pictures we proceeded for our next viewpoint. 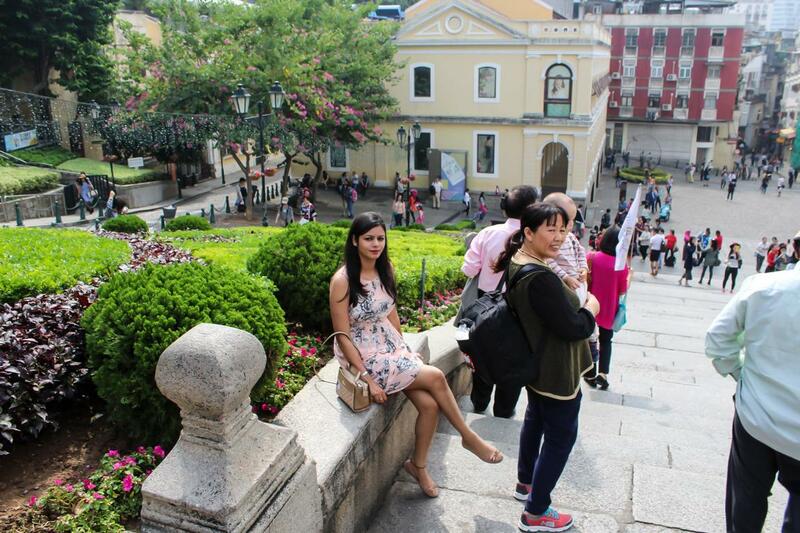 It is one of the most famous square in Macau, located in the central area of Macau. This place was filled with people , which isn’t ideal, but you can expect that from a tourist area. We clicked some pictures around it. There are few gift shops and supermarkets available at the Senado Square in case you want to buy some souvenirs or snacks. 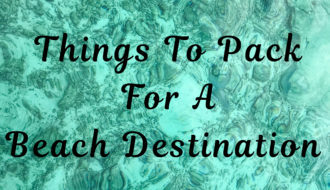 You can also sit back and relax for few minutes and eat your carry on snacks here. 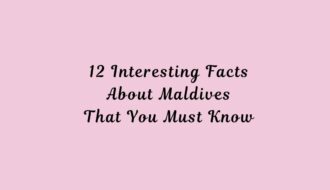 It is located between Ruins of St Pauls and Senado Square. Its yellow coloured walls make it a centre of attraction. It has a beautiful architecture with calm ambience. We sat inside for few minutes. 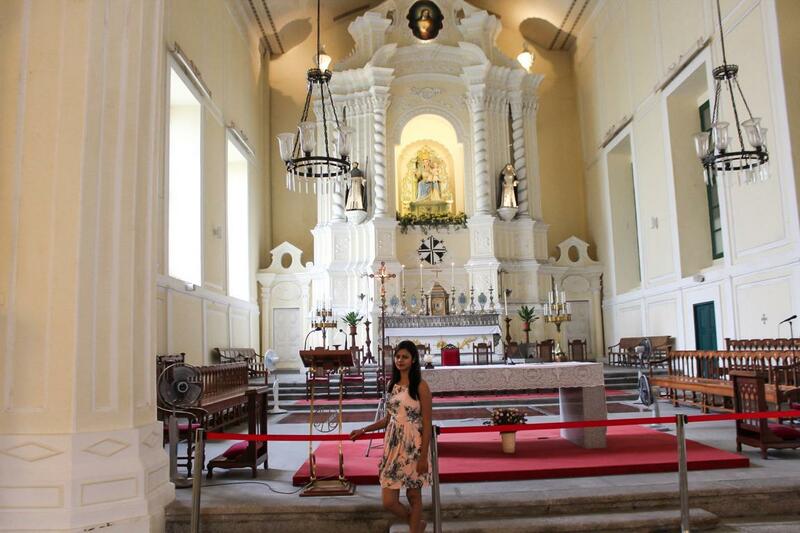 It was extremely quiet and comfortable inside the church. It has a statue of Madonna and Child as a centerpiece. Its Chinese-style roof tiles and doors made of teak makes it more beautiful. Our tour guide was carrying a red coloured flag and we were following her to explore this beautiful village. It is one of the traditional village in Peninsula. We enjoyed walking around many small laneways in the village. It has a lots of small shops to buy souvenirs and gifts. You can also try some tart shops and restaurants. The old town Portuguese architecture is what intrigued me the most. 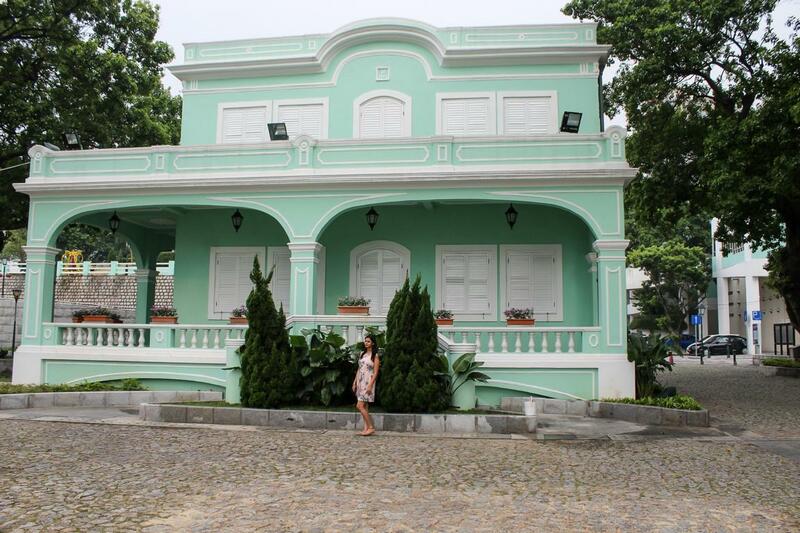 It is also known as the heart of Taipa village. A small interesting row of shops on each side of lane having souvenirs, tarts, cookies and cakes to eat while wandering around the city. The Portuguese egg tart is a very famous dish in Macau. I still remember it’s creamy custard filling with flaky outer shell. It was very delicious. You can easily find tarts everywhere. But I will suggest Koi Kei Bakery. They have free samples for all their cookies and plenty of fun gift box options to bring home. It has branches all over Macau. They sell egg tart, cookies, moon cakes, traditional cakes, candies, almond cookies and much more mouth watering food. The A-Ma temple is a temple to the Chinese sea-goddess Mazu. 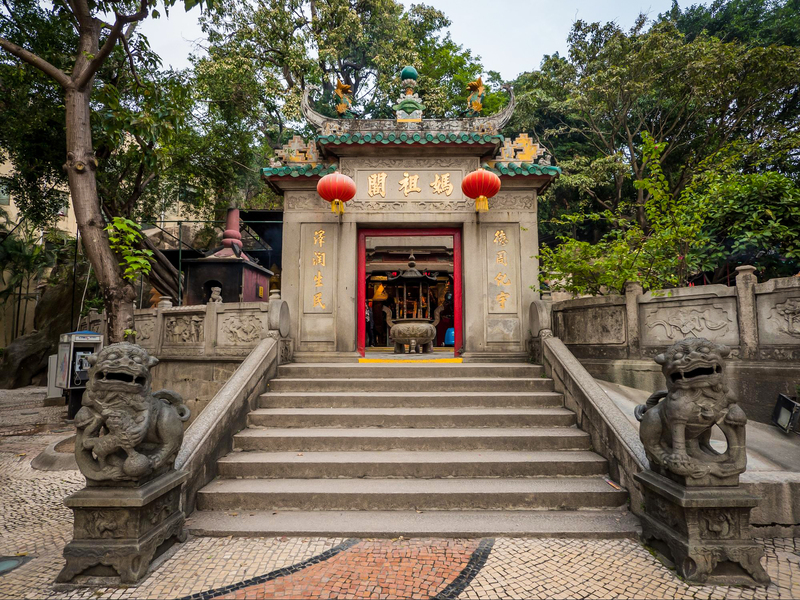 It is one of the oldest temples in Macau. The temple was lighted beautifully with lots of incense sticks and they were spreading a pleasant fragrance and positive energy all around. It was a small uphill walk to reach the temple, which was not at all tiring. We also tried a cookie shop nearby temple, recommended by our tour guide. We tried some tart, chikki and cookies. Finally we proceeded to our last destination. 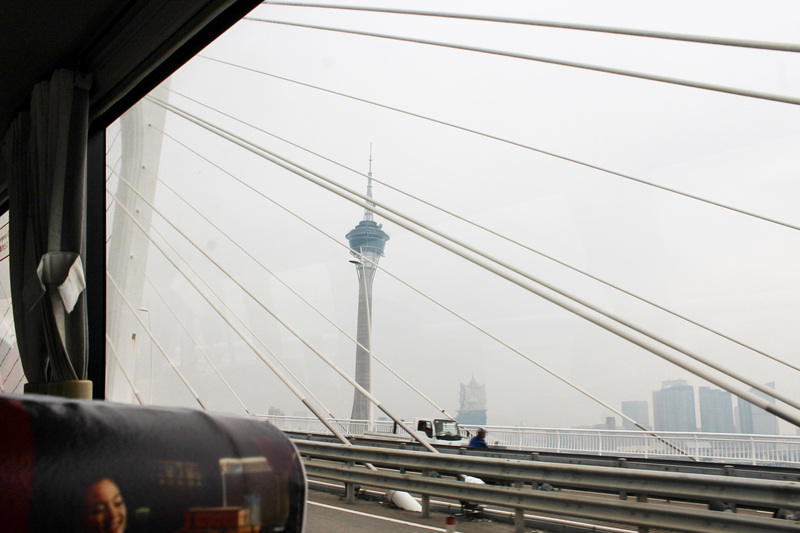 We de boarded our tour bus to reach at a neck pinching height of 1,109 feet, Yes it was the Macau Tower..!! It is the 11th highest tower in the world. 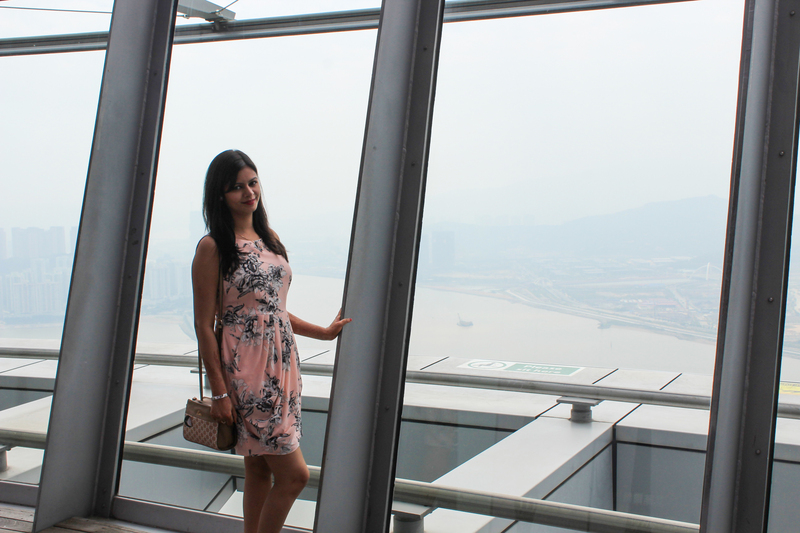 You can take the lift to the tower’s 360-degree observation deck for a spectacular view of the Pearl River Delta, which is more fabulous at night. We got the best views of the city from the top of tower. If you are looking for adventure then it is the perfect place for you. You will find different packages of bungee jumping that you can choose according to your own convenience. For those who just wanted to seek some thrill, they must try glass walkway and conquer their fear of height. After the tour, we came back to hotel around 01:30 pm. We had lunch buffet at Indian restaurant “The Golden Peacock“, at level 1 of The Venetian. Here we used our free coupons which were given to us at the hotel reception during check in. There were lots of vegetarian options in this restaurant. The food was very delicious. There are other vegetarian restaurants in the hotel but we wanted to try Indian cuisine. Trip to Macau would be incomplete without an authentic Gondola Ride. A ride with your personal musician is a delight for romantic souls in the city. It is also known as “Little Venice”. We bought tickets of 128 MOP for a ride. Tickets are easily available at Boutique di Gondola(shop no 832) and Emporio di Gondola (shop no 891). We booked an amazing Grand Canal ride for 6 o’clock in the evening. You can book morning rides as well. Timings for Grand Canal is 11 am to 10 pm and timings for Marco Polo Canal and San Luca Canal is 11 am to 7 pm. We clicked lots of pictures and enjoyed this romantic ride. It is a short ride but worth the money. After completing our ride, we bought photo cards, key chains and show pieces of our own pictures clicked on gondola. These were the very beautiful souvenir of Macau memories. 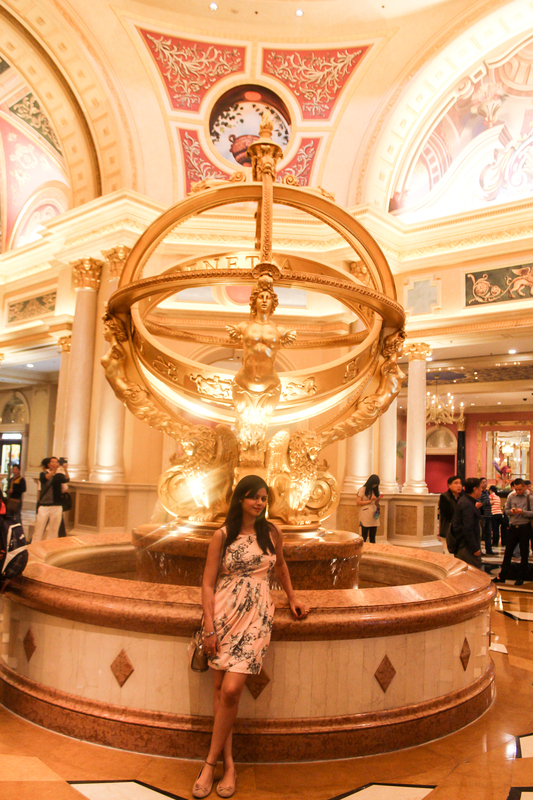 The Venetian Macau has one of the largest casino in the world. Macau is the only place in China where casinos and pari-mutuel gambling are legal. The most popular casino game in Macau is baccarat. If you are a casino fan then it is the great place to try your hand at a card table. After this we were just wandering around in the hotel. The hotel was really beautiful. 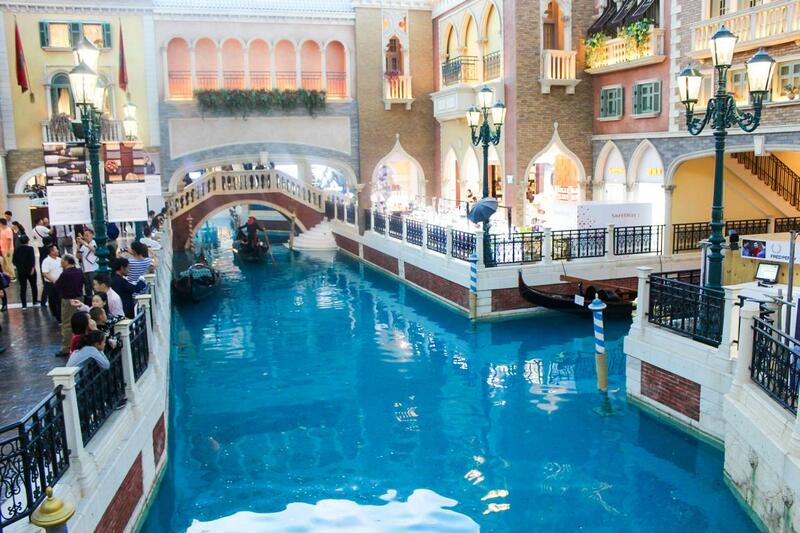 Venetian has a great range of shopping, dining and entertainment facilities. 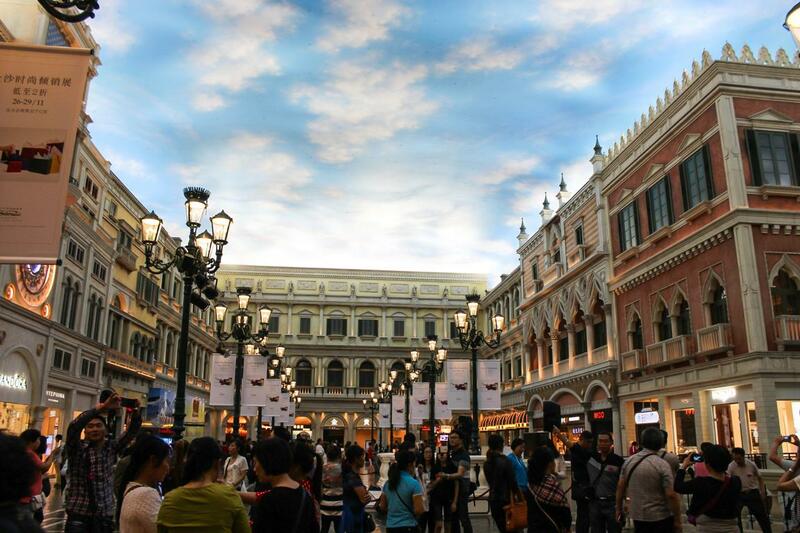 It offers the most diverse range of luxury shopping in Macau, all under one roof. You can walk around the shops and also buy some souvenirs. You will find many shops including men and women clothing, cosmetics, jewellery, shoes accessories, leather goods, departmental store, audio visual and electrical accessories, gift stores for children, health medicines and many more options. You will also find a vast variety of cafes, restaurants and lounges. We had dinner at “Vergnano Italian” restaurant inside the Venetian. Here also we used our complimentary meal coupon, which was given to us at the hotel reception. We ordered a vegetarian pizza and a pasta, which were mouth watering. They serve delicious Italian food. After breakfast, we did a self checkout by dropping our keys into a key drop box. 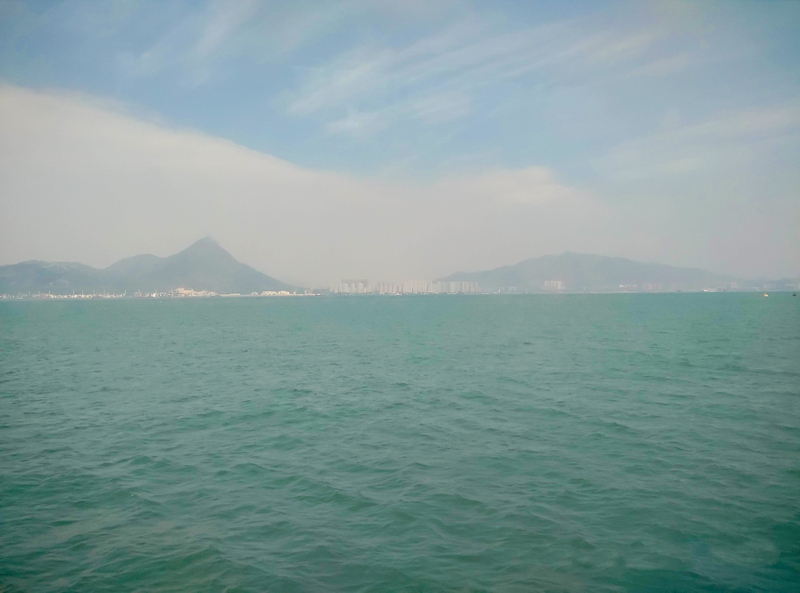 We moved to our next destination by taking a ferry for Hong Kong from Macau ferry terminal. 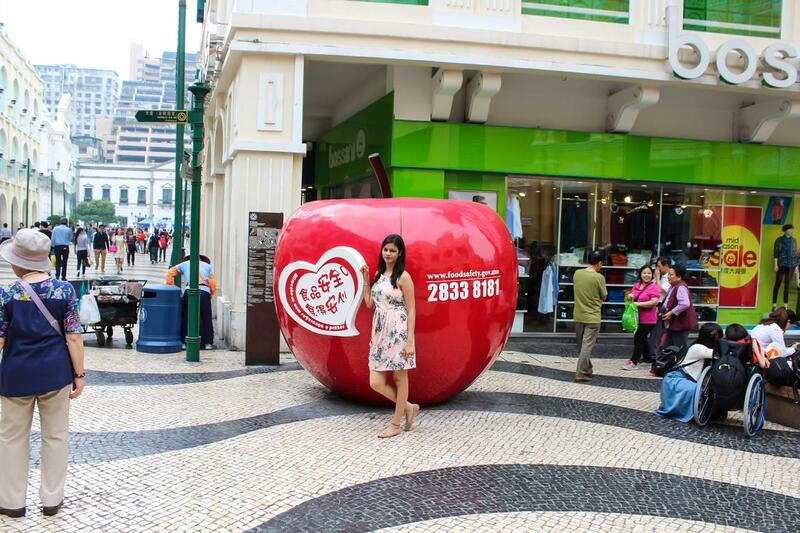 In my opinion, Macau is truly the City of Dreams. Thank you for reading Magical Macau, I hope you liked it. 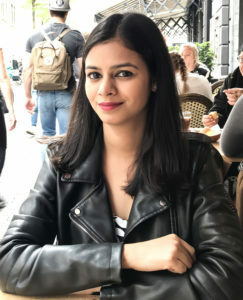 Soon I will post my experience of Hong Kong. Nice blog. It is very helpful and complete guide to Macau. All the best for coming blog posts. Keep it up..!! Thank you Luda. Yes the hotel was very huge and beautiful. Enter your email to Subscribe my latest posts! 2019 Copyright The Globetrotter Lady. All Rights Reserved.